New Jersey Secretary of Agriculture Douglas H. Fisher today announced that New Jersey Department of Agriculture and United States Department of Agriculture personnel confirmed the first sighting of the spotted lanternfly in New Jersey. The sighting was made in portions of Warren County recently. 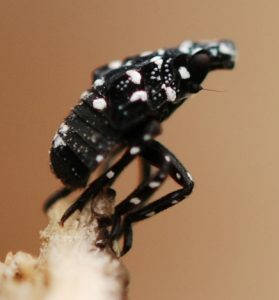 The species (see photos at left) is currently in its nymph stage and is likely to be either black or red with white spots. The spotted lanternfly, which is native to China, India, Vietnam and East Asia, was first located in Pennsylvania in 2014 and has spread to 13 counties there. The pest prefers Tree of Heaven as its host. The New Jersey sighting was made on Tree Heaven, which were treated to help prevent the spreading of the pest. Surveillance will continue in that immediate area as well as along the Delaware River border. Department field crews have been conducting surveys for this insect along the New Jersey-Pennsylvania border since 2014, from Warren to Burlington Counties with no previous findings. 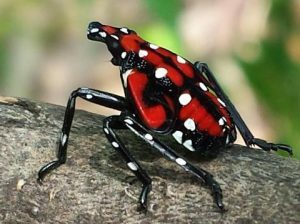 The spotted lanternfly has a history of being an excellent hitchhiker, having the ability to stay connected to vehicles that travel across state borders. The insect’s movement into new areas happens through the relocation of adults, nymphs or egg masses. The NJDA and USDA asks everyone who travels to and from Pennsylvania inspect their vehicles for the insect before returning to New Jersey. The spotted lanternfly makes use of over 70 different plant species, including fruit trees, ornamental trees, woody trees, vegetables, herbs and vines, including agricultural crops like grapes. The lanternfly in its currents stage is about a half-inch to three-quarter of an inch long.